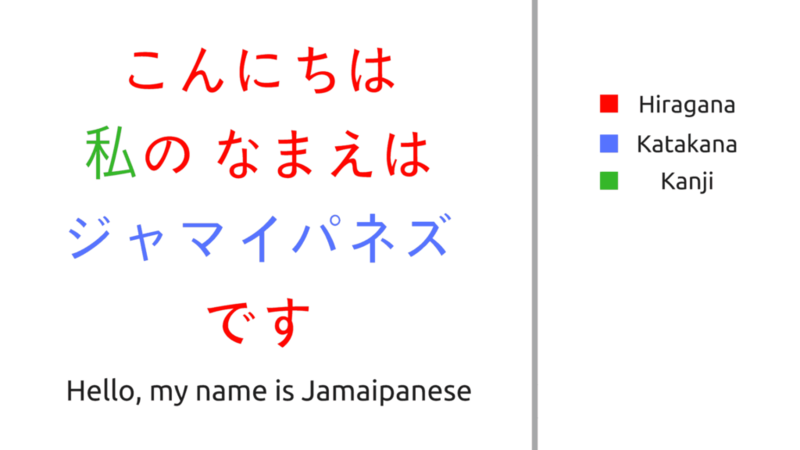 HomeJapanWhere do you start when learning Japanese? In a recent vlog, I spoke about having a Japanese focused video series. Over the past few weeks, I have struggled with getting it recorded as my perfectionist mentally has taken over and I have recorded and recorded it more times than I would like to admit. So what am I going to do? Continue doing what I have been enjoying! making video logs of vlogs of my experiences living in Japan. This includes things I have vlogged already such as travelling, video games, food etc but now from time to time it will include commentary on my own journey learning Japanese as well and I am keeping the name Nihongo to Kakutou suru (日本語と格闘する) – or fighting with Japanese! It goes without saying that Japanese is very different from English. Its different from all Indo-European languages. Japanese is written using 3 alphabets – Kanji – borrowed from Chinese, Hiragana which are simplified kanji characters and Katakana which is used to primarily for foreign words but also has other uses you don’t have to worry about at the beginning of your Japanese language journey. Before I continue I must say that I am no qualified guru of the Japanese language, I am just learning the language like anyone else but have spent a lot of time trying different methods of learning with varying success over the years. Now that I live in Japan – learning Japanese is now about surviving here so I have been more serious about it in recent months. If you are just starting out learning Japanese then without a doubt, you first want to learn Hiragana and Katakana. Learning to write and read Kana as they are called together to me is the first pillar towards building your Japanese ability. So how do you learn Kana? You practice! For some people it takes a few hours, for others, it can take months. My advice? – study ’em five at a time. You can use apps, flashcards or the good old fashioned pen and paper. Write them, enunciate their sounds and in time you will know them. Kana Dojo – from the same developers of Katakana and Hiragana pro another gamified app with “eye Spy” agility test and “Matchmaker” memory test that mixes things up a bit and allows for studying in short sessions. Japanese Word Dungeon – This is straight up a game where the aim is to defeat monsters with your knowledge of kana – Personally I don’t like how it is monetized but the level 1 dungeon is free and gives you just enough to know if its something you will want to pay for going forward. There is no shortage of apps out there to help with Studying Japanese but don’t be like me not long ago and get buried in the options walking around with 20 plus Japanese learning apps on your phone but barely using any. Stick to one or two and start learning Japanese! As far as speaking is concerned, I don’t think you need apps. Just speak to as many Japanese people as you can, and ask them to kindly correct you if your grammar is wrong!! Learning kana is a must, and keep a list of the most common kanji that you see, gradually adding to it. I had to learn around 1,300 “for starters” when I started Japanese!